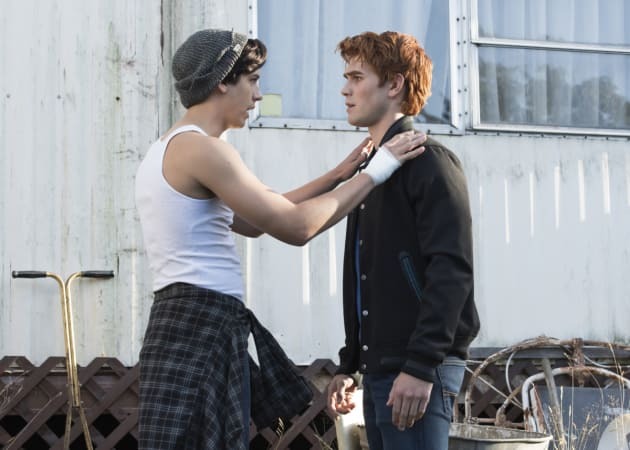 Jughead and Archie are stuck in the middle of a growing war between the two sides of Riverdale. Will the best friends have to fight each other? Riverdale Season 2 Episode 5: "Chapter Eighteen: When a Stranger Calls"
The Black Hood: Give me another name. Right now! The Black Hood: If you want to save your sister, give me another name. The name of someone guilty. Come on, Betty, one little name. Betty: I won’t. I can’t do that. The Black Hood: Then I’ll kill your sister...and your mother...and your father...and everyone you hold dear! Betty: Nick St. Clair. He’s staying at the Five Seasons. The Black Hood: I told you we were the same. Permalink: I told you we were the same. Veronica: Nick, I’m sorry if I gave you the wrong impression. I’m with Archie. Nick: Oh come on, Vee. You barely looked at that hayseed yokel all night, you were all over me. Veronica: Nick, we’re friends. We’re old friends. Veronica: Nick, I mean it! Stop! Nick: Same old Veronica. You flirt and you tease, but in the end, you think you’re better than me. Nick: With the power to implode this pathetic deal your criminal father so desperately trying to make happen. So unless you want that to go away, I’d be thinking of ways for you to start showing your appreciation. If you need any help, I can suggest a couple.